What are those thin magenta lines on the Sectional / Terminal Area Chart near Death Valley? 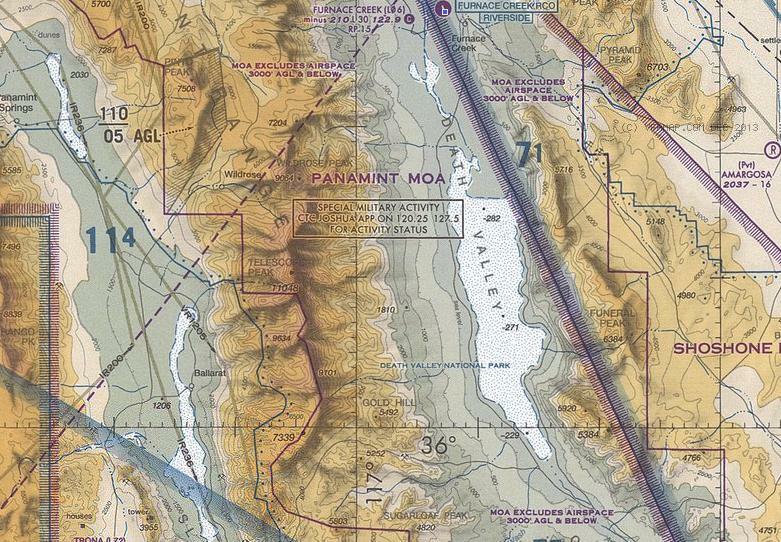 Due west of KLAS and Death Valley are a large number of MOAs and Restricted areas. On the sectional and terminal area charts, there are thin magenta lines snaking over some of the mountain tops. What do those lines represent? They don't seem to be a mode C veil of any sort, and the legend doesn't otherwise mention a thin magenta line without spikes. Notice the same style magenta lines are drawn in circles around airports in the MOA which also have the same style remark excluding a specific portion of the airspace. Not the answer you're looking for? Browse other questions tagged aeronautical-charts symbology or ask your own question. Why are there out-of-date tower frequencies on the VFR sectional chart, without a NOTAM? What's the standard print size for a sectional chart? What is the thick, dashed, magenta line on a sectional chart? What is “abnd” on the U.S. VFR Sectional Chart? What does AOE on the sectional chart mean? Re old (1992) US VFR sectional charts— when was the thin dashed magenta line first used? Is there any example of a US VFR sectional chart containing both a reference to “Class E” airspace, and to older terminology for the same airspace? What is the radius of a VOR compass rose on a VFR sectional chart?